LONDON, March 24, 2016 — /EPR NETWORK/ — Finally the extortionate roaming charges travellers face when they go abroad has become a thing of the past. Roaming experts, WorldSIM have launched a new smart international SIM card that allows international travellers to pay the same rates as locals when they travel overseas. Importantly, users can also roam on their existing number with the use of WorldSIM’s virtual phone number service. In Canada and Mexico, a call back to the US is just 22 cents and it’s free to receive calls. What’s really impressive is that WorldSIM offers international travellers going further afield very low rates as well. In Europe data rates start from 15 cents per MB and so do calls. Incoming calls are free in 95 of the most popular international destinations. The service remains a prepaid service and no subscriptions are required. Just recharge when you need more credit. The new WorldSIM international sim card also offers roaming in more destinations than most operators worldwide. With their new release sim card, 25 new roaming destinations have been added bringing the total to 195 roaming countries. This means travellers can now stay connected for less in more exotic locations like Belize and the Bolivia. 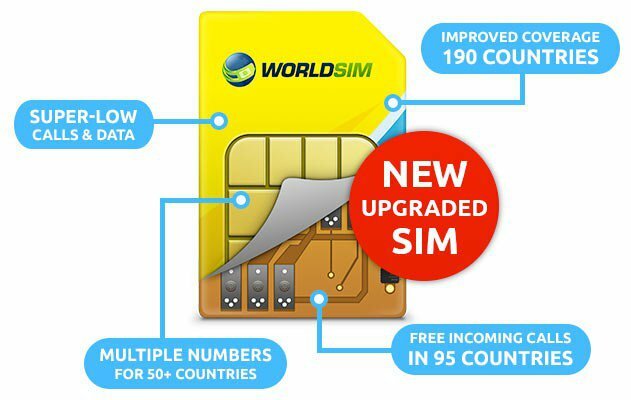 Very soon, WorldSIM will also be launching global bundles, in many destinations travellers will be able to get 1GB of data and unlimited calls for just $30. This new travel SIM card offers billing in multiple currencies and the technology has been improved to allow the sim to connect automatically to the operators with the best rates and coverage. The roaming SIM works in any unlocked handset and comes triple punched so it fits into all cell phones and tablets. With the vacation season approaching thousands of travellers will be hit with unexpected roaming bills and they aren’t the only ones that suffer. Small businesses pay on average $252 per device for bill shock, while larger companies pay up to $395 per device*. *According to a survey by Wondera.